Lake Powell is the second largest man-made lake in the US and without doubt the most scenic, stretching 186 miles across the red rock desert from Page, Arizona to Hite, Utah. It began filling in 1963 following the completion of a dam across the Colorado River near the south end of Glen Canyon, and was not completely full until 1980. 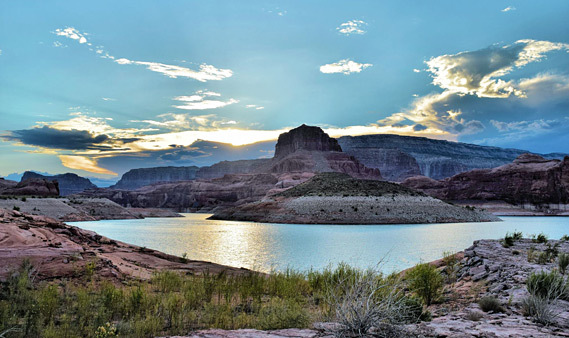 In 1972 Lake Powell and the surrounding countryside was incorporated into Glen Canyon National Recreation Area, and since then visitation has increased steadily. 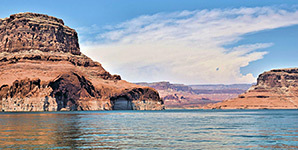 What makes the lake so memorable is the contrast between the deep clear blue waters and the surrounding landscape - stark red sandstone rocks with little or no vegetation, the innumerable steep remote side canyons, and the spires, ridges and buttes that once stood high above the Colorado, but now form cliffs at the lakeside or are semi-submerged as small islands. 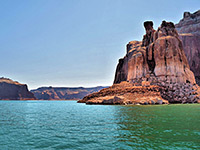 Lake Powell has become a major center for many leisure activities, principally fishing, water sports, hiking and houseboating. 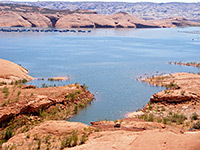 Access to Lake Powell and Glen Canyon by road is very limited. Activities are concentrated at the western edge, near Page, where various beaches, resorts, marinas and campsites are found along the shoreline, with every necessary facility available in town. At the far northeast end of the lake there are basic services and a few tracks leading to the water at Hite, though decreasing water levels in recent years have left this village quite far from the shoreline. The only other paved approach roads are to the Bullfrog and Halls Crossing marinas two thirds of the way up the lake, which are opposite each other and linked by a car ferry. 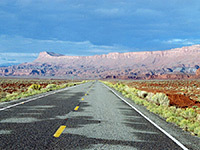 Apart from these four locations, various long dirt tracks lead to places along the lakeshore but these are generally only suitable for four wheel drive vehicles, although normal cars can drive along the Smoky Mountain Road, north of Lake Powell near the western end. This allows access to some beaches, before the road turns north towards Escalante. There are very few maintained paths in the 1.25 million acres of Glen Canyon NRA; otherwise, hiking is off-trail, visiting narrow canyons, overlooks of the lake, hoodoos and other eroded formations. 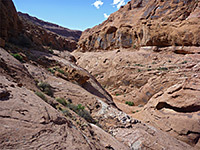 There are many other narrow canyons close to the NRA, including those near Page, North Wash, Trachyte Creek, White Canyon and the Escalante River. 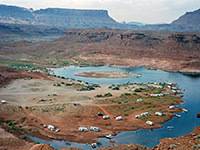 Page is the only town anywhere near Lake Powell with accommodation. One of the top rated hotels is Holiday Inn Express Page, a recently constructed (2014) property located on the west side of town along Lake Powell Blvd; adjacent to a shopping center with several restaurants, directly opposite Lake Powell Golf Course, half a mile from Wal-Mart and one mile from the edge of Glen Canyon - an easy walk over flat, sandy desert. More Hotels in Page - hotel descriptions, reservations and map.